"Based On The Immortal Classic by Edgar Allan Poe" say credits, which it isn't, but in 1932, who knew ... or cared much? You could watch and easily imagine this was pure Poe, for there was Paris setting, in the right period (mid-19th century), and with a gorilla (or more accurately, orangutan). But was ape-impersonator Charles Gemora's an orangutan suit? If so, then he was an orangutan for dozens of other features and shorts. In fact, Rue Morgue's monkey is a pair --- one real, for close-ups, the other Gemora in action or longer views. Survey of ape-suit fanciers would place his interpretation at tip-top, Gemora a best thing on screen next to Lugosi. But what of Poe in all this? Could Universal rightly claim any of it as derived from the author? 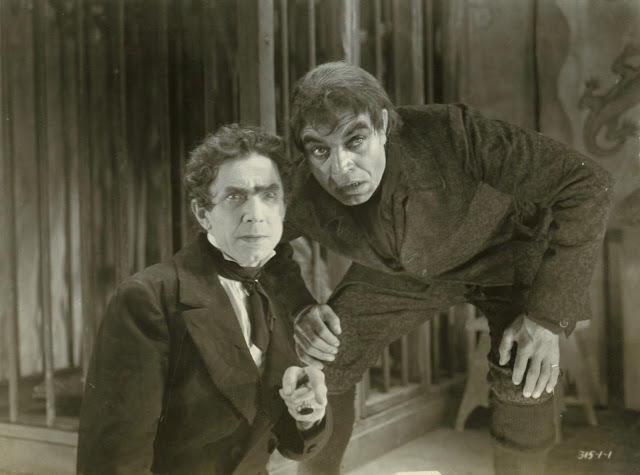 Robert Florey was put to Poe mix w/ Lugosi trimming. He was supposed to adapt and direct Frankenstein prior, was let out at eleventh hour and replaced by James Whale. Mavens argue Florey would have finished a better movie than Whale. Based on Murders In The Rue Morgue, I might agree. Good discussion on all this is had in Brian Taves' Florey bio, still available and outstanding. Taves knew Florey and got his side of events, also detailed account of Rue Morgue making. Others of the production spoke with Taves as well. To Poe as addressed by Florey, text is translated to extent of a few key scenes right from author page; readers not having been there lately might think Florey's was altogether faithful translate. I read the Poe story ahead of watching. You couldn't make it into a movie as is, at least not a visual or even coherent one, which Florey knew, but made best of. Given that circumstance, no one could have played Poe fairer. 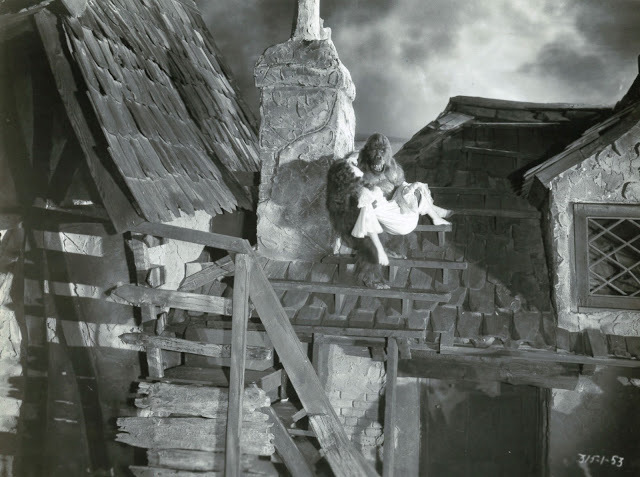 Source story is gory, more so than films dared be, even in pre-code. Two women are killed, one choked, stuffed up a chimney, the other decapitated and thrown out a window. Poe describes it all with relish. 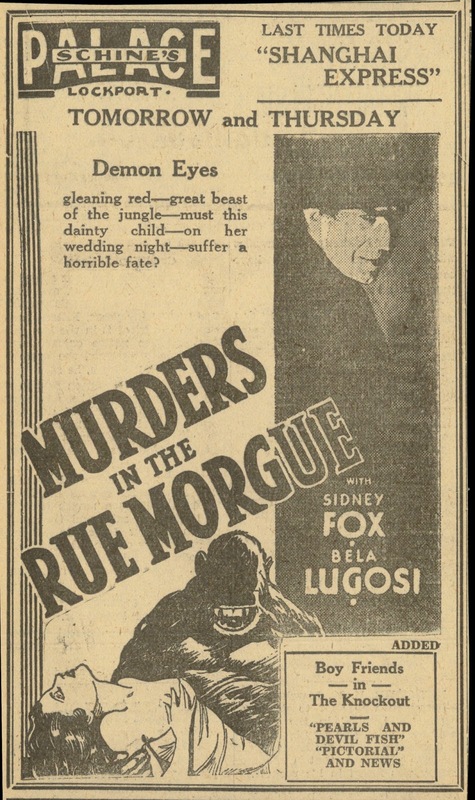 His Murders in The Rue Morgue is recognized as pioneer of the detective story, most aspects of the form introduced here. Poe's sleuth is named Dupin. A character answers to that in Universal's film, but he's a medical student (Leon Waycoff, later Ames) who unravels the crime, but for personal reason (Sidney Fox). The Poe Dupin, a lead in three of the author's stories, is methodical in the extreme, parsing details for their own sake, and never in the thick of action, closest contact with mystery being visit to murder scenes (sometime not even that ... he'd unravel The Mystery Of Marie Roget from an armchair at home). Dupin is a chilly persona, has a companion whose function is to be corrected, and often. Dupin's not a literary figure we warm to. 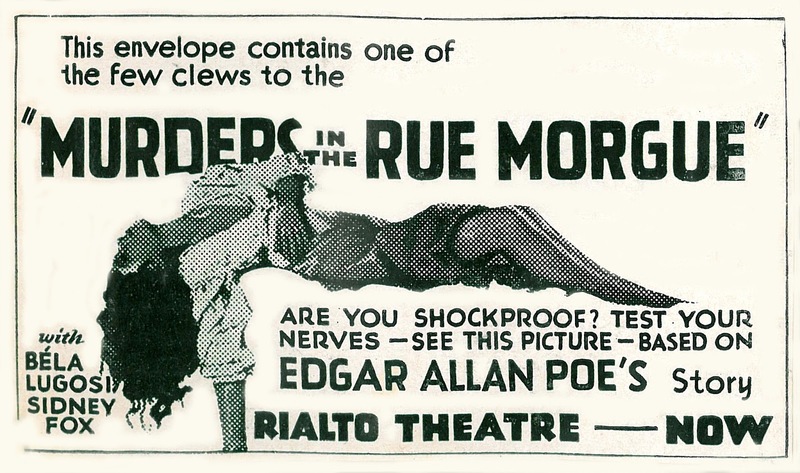 Poe used him in Rue Morgue, Marie Roget, and The Purloined Letter. With better luck and popular response to Dupin, Poe might have been Conan Doyle's success arrived early, for Sherlock Holmes and Dr. Watson were certainly measured from cloth he cut. Just as Doyle modified Poe's concept for his Holmes, so would Florey adjust Poe for screens. The author was yet to be fully embraced by academia. His stories and poetry was read in schools, but not to degree they would be later. 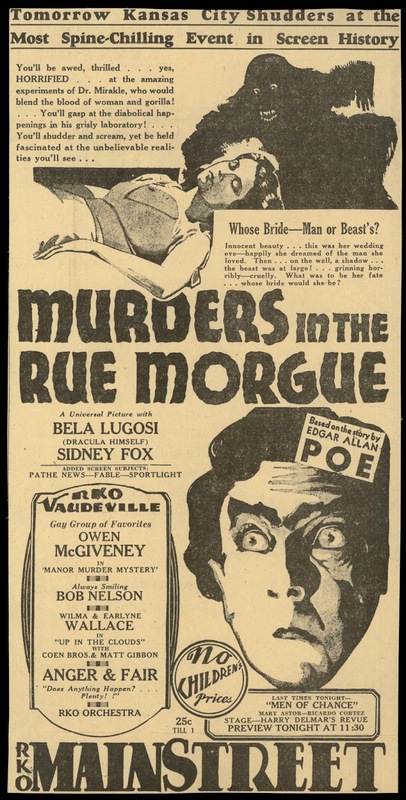 Poe was better in the 30's to market movies, a morbid tag hung on him that would cling like flypaper. What writer has been filmed so often as Poe? Truest of advantage was free sign attached to output, PD status a basis of immortality (would Jim and Sam have done their 60's series had there been a fee for Poe?). Robert Florey's treatment was closer to Poe than movies would go for at least a rest of that decade, if not all time. The most later ones could claim was faith to "The Spirit of Poe," which I guess you could say about any horror movie back then. Far afield as The Black Cat and The Raven would be, they were at least Poe-ish, or Poe-tic, or should that be Po-etic? Anyway, they worked, and $ might properly be ascribed to his name hovering above or below titles (some even possessory, Edgar Allan Poe's ..., as though he were still active, and with a demanding agent). Florey was cultivated and had pioneering appreciation for film history. He'd study technique and fellow directors long before others bothered. Florey also made experimental films. He should have had one of the great careers instead of mostly B's he wound up with by the mid-30's and after (but these models of their kind, say later champions like William K. Everson, who had more access to them then than we enjoy now). 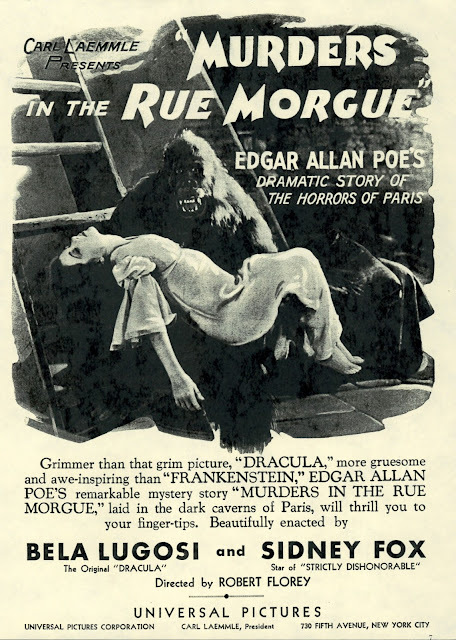 Florey knowing past films meant he could borrow from the best to dress up Murders In The Rue Morgue. It is by far most Caligari-ish of Hollywood lifts from the German trend-setter. You could lower sound on Rue Morgue and just stare at it, but for missing Bela Lugosi's rich dialogue. Every scene is a visual doozy, and like any good short story, wraps in an hour. 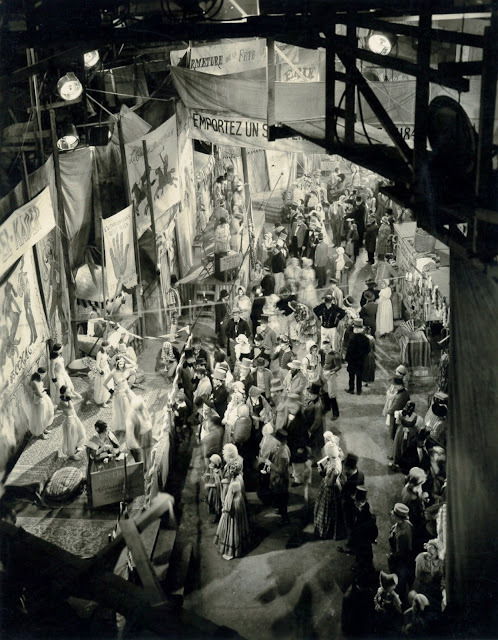 Florey told author Taves how he and cameraman Karl Freund scavenged old flats, canvas, props, to decorate their show, Rue Morgue remarkably handsome for mere $190,099 spent to make it. Back then, to the ape. He was Poe's creation, and maybe the author saw a next century's exploitation coming, his orangutan the point man, or monkey (man/monkey where it's Gemora), for most of selling. Girl meets gorilla had been played on Ingagi and Blonde Captive terms, both trashy but titillating. 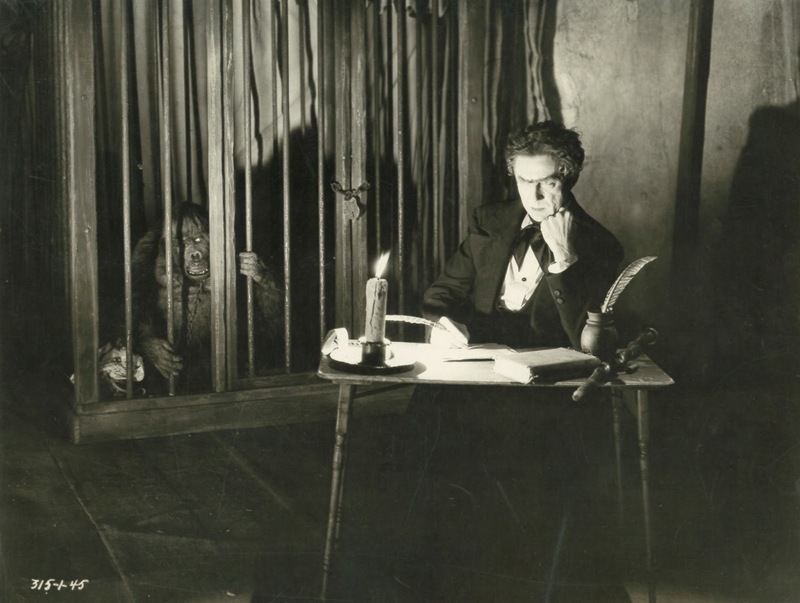 Murders In The Rue Morgue would mainstream the theme, height reached a following year with King Kong. Why mutilate your victim, as did Poe, when she could be decorously carried off to who knows what purpose? Patrons could guess ... or hope ... and that sold tickets. Ask Ingagi's makers, or 50's updating with Bride Of The Gorilla, many others. 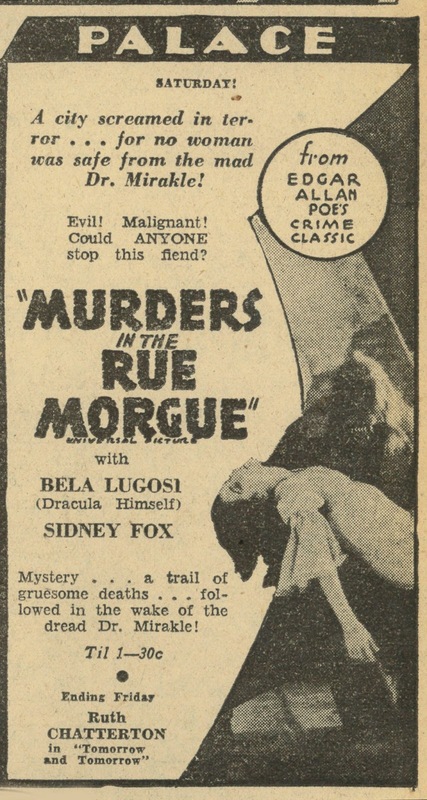 Murders In The Rue Morgue would sustain for years on gorilla/girl art, theatres still using it right up to TV surrender in 1957. There isn't HD streaming or a Blu-Ray at present, but Universal has an excellent DVD, albeit jammed onto a single disc with four other chillers. The trick is locating one that won't skip or freeze up. Lots are so stricken, as I understand from forums. Florey directed what I feel is the ultimate Poe-ish character onscreen - Lorre in The Beast With Five Fingers. A rip on Tell-Tale Heart. 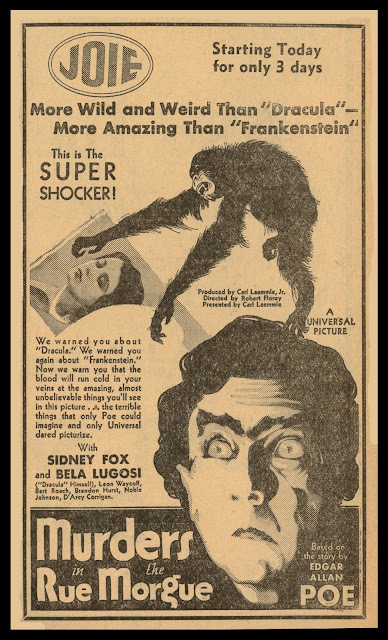 At this point in his Hollywood career, I'm surprised Lugosi's name wasn't played up bigger in the ads. Even this early in the game, Universal seemed to lose interest in Lugosi - he, like Florey, having been ousted from Frankenstein. Never used him again in this kind of solo starring capacity, but rather as contracted player Karloff's sidekick. Import it to your computer via dvd43. It's too good a film to lose due to defective dvds. 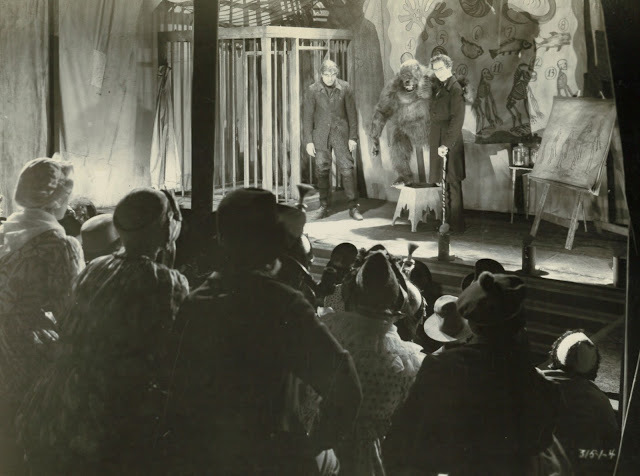 I really love the 1932 Murders in the Rue Morgue, but, as a teen in the 1960s, the combination of the Ape Suit and the inserts of a Chimpanzee always bothered me. It bothers me a bit less now -- Maybe I tune it out by letting Lugosi's excellent and mesmerizing performance rule those scenes. The other curiosity that I had was why many magazines referred to an Orangutan (which the actual animal in the film is not, as it is a Chimp). It was not until finally reading the Poe story a year or so ago that I realized why many people call the animal an Orangutan (as that is the animal in the written tale). Still, in the Universal Pictures movie, those inserts are of a Chimpanzee and not a Monkey and not an Orangutan. At least now I know why people sometimes mistake the live creature in the movie with the creature in the 1841 publication of Poe's "detective" story. I was watching this one day when a couple of teenagers walked in. After a few seconds they were riveted to the screen. I invited them to watch it. I thought EVERYONE knew who Bela Lugosi is. Nope. They had never heard of him. When it was done they wanted more. That's movie making. Universal got Bela too cheap to value him. Consistently throughout his career Universal gave him way less than they gave Karloff. Time has been on Bela's side, though. His name still shines while many of those (most) billed over him are now forgotten by the public. Not happy to hear others had the same problem with the dvds of this set as I did. I learned to make work copies of these long ago while they are new. The work copies work while the originals sometimes don't. My DVD still plays fine, and has from the beginning. I know several others, however, who went through multiple discs and never did find one that was satisfactory. For some reason, this movie leaves me disappointed. Both the script and direction are kind of pedestrian -- except for the scene with Lugosi and Arlene Francis. It's so much more atmospheric and scary than the rest of the movie that I've wondered if it wasn't directed by co-writer John Huston.